Ford has completed its new ST-Line model range in Ireland, featuring vehicles with sporty styling inspired by ‘Ford Performance’, and offering a range of powerful and efficient EcoBoost petrol and TDCi diesel powertrain options. Joining the Fiesta and Focus ST-Line models that were launched in early 2017, new ST-Line versions of EcoSport, Mondeo, Kuga, S-MAX and Edge are now available from Ford dealerships across the country. Delivering bolder exterior and interior designs inspired by Ford’s acclaimed ST performance models, the new ST-Line range is designed for customers who aspire to the sporty image of Ford’s ST models, and do not require the full performance delivered by optimised ST engines and chassis with sports technologies. The ST-Line range is offered with a range of powerful engines including Ford’s multi-award-winning 1.0-litre EcoBoost petrol engine, sport suspension and body styling, unique alloy wheel designs, and sport seats, sport steering wheel and alloy pedals for the interior. Ciarán McMahon, managing director of Ford Ireland, says the ST-Line range makes it easier for more customers to experience the "sporty style and driving dynamics inspired by the most exciting Ford Performance line-up ever". "That includes models such as the Focus RS, Fiesta ST200, Mustang and Ford GT supercar,” says McMahon. For example, the EcoSport ST-Line model boasts Ford’s award-winning 1.0 litre EcoBoost petrol engine with higher power outputs of 125PS. For the Kuga ST-Line, diesel powertrains on offer include a 120PS 1.5 litre TDCi or a 2.0 litre 150PS and 180PS options. “The ST-Line range offers customers a chance to enjoy the famous fun-to-drive characteristics and great looks of Ford’s performance models in an exciting and affordable package with a broad range of petrol and diesel engines,” concludes McMahon. Ford says ‘Performance’ car cues abound in the ST-Line specification, including exclusive rock alloy wheels; body-coloured styling kit; the afore mentioned sports suspension; sports-style seats; black headliner; sports pedals and ambient lighting. By way of example, some key features Ford EcoSport ST-Line key features include: 17” alloy wheels dark tarnish; Ford SYNC 3 Navigation with 8” touchscreen, DAB radio, emergency assistance, Apple CarPlay / Android Auto, 2 x USB sockets and six speakers; full body-styling kit; contrast coloured roof and mirrors; and sports-tuned suspension. 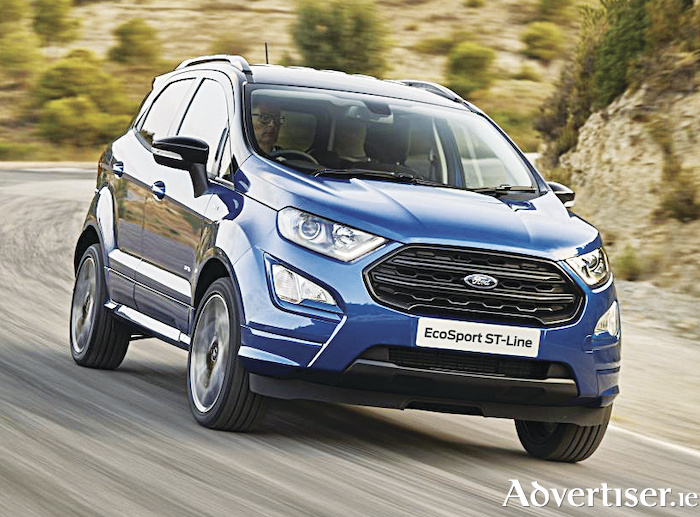 And the Ford EcoSport ST-Line five-door, 1.0 litre EcoBoost petrol, 125PS 119g/km, starts from €28,180.